DiGiulio, A. (2016). Book review: Social spaces for language learning: Stories from the L-Café edited by Garold Murray and Naomi Fujishima. Studies in Self-Access Learning Journal, 7(4), 379-382. 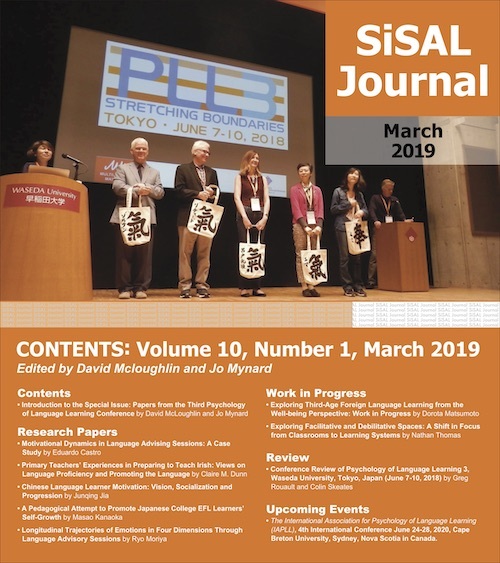 Social spaces for language learning: Stories from the L-café describes the background, evolution and impact of the L-café, a social language learning space (SLLS) at Okayama University, Japan. This book is a must-read for anyone considering creating a similar space. The book is structured into three sections containing chapters from administrators, teachers and students involved with the center in a variety of capacities. Murray and Fujishima, the editors, utilize narrative inquiry, a style of research which they define as documenting stories of lived experience and interpreting them in view of the literature. In the first section, administrators describe the decision to create the space, the planning, opening and running of the space. They also outline the growth and evolution of the space. The evolution came first via an expansion and then a relocation and shift in focus to all foreign languages, rather than just English. In this section, we receive detailed accounts of two separate managers, Uzuka in Chapter 3, and Fujimoto in Chapter 4, who each describe their management style and rationale for running things the way they did. In the second section, several teachers relate stories regarding the role that they played in the space, and in one case, what they used the space for (Lamitie in Chapter 5). In the final section, student users and student staff relate their experiences with the center and what it meant to them. Thus, by reading through the volume, the reader can experience second-hand the decision making, challenges and potential affordances provided by the space from the perspectives of actual stakeholders. In the final chapter, Murray and Fujishima utilize the literature, in particular, complexity theory, to tie together the experiences and explain many of the phenomena which come out in the narratives. They use this to create a provisional model for SLLSs which they believe should be considered when creating or managing such spaces. The L-café, which began as the English Café in 2009 at Okayama University is described as a social learning space. The impetus for the creation of the space is attributed to the fact that Okayama University was chosen to become one of several “Super Global” universities by the Japanese government and received grants to accomplish this end. This also led to an increase in international students which several of the narratives report has played a large role in the success of the space. According to Murray and Fujishima, the defining feature of SLLSs is the focus on language learning through informal social interaction. This perhaps differs from most self-access centers which tend to focus on language learning through its materials, resources and/or services. For many self-access centers, the social aspect of learning is there but it may not be the main focus as it is here. The editors note that SLLSs are a relatively new type of facility and comparatively few in number. They also point out that research specifically focusing on SLLSs is sparse. Still, many of the services described in the text (a study abroad center, a writing center, a conversation lounge/partner system, among others) will be familiar to those working in self-access centers. It is, however, the distinct lack of traditional learning materials which sets these spaces apart. However, that is not to say that there are no resources. On the contrary, a common theme in the book which comes up again and again from different authors, is that the people are the learning resources at the L-café. They are the keys to the ultimate success or failure of the space. Language policies and lack of adherence to these policies have been debated by those involved with running self-access centers for more than a decade. The L-café has no such policy. This was a deliberate choice in order to make it easier for Japanese students who are not confident in their abilities to enter. This theme of exclusivity or closedness is another important one which comes up throughout the book; another point of commonality with self-access centers. The presence of teachers, and perhaps more importantly, international students provide the opportunity to speak with natives and help to create diversity, reciprocity and neighbor interactions; all features which the editors include in their provisional model for SLLSs. It is likely that different sections of the book will appeal to different people. Because the book tracks much of the center’s early development and points out many of the important decisions which needed to be made leading up to the creation of the space as well as trouble spots and practical matters which needed consideration, the book may be particularly useful for individuals who are considering creating a similar facility or who are in the early stages of planning. For current practitioners or those who have been through this process, much will be familiar and may not provide many deep insights. The middle section of the book, devoted to teachers, may appeal to other teachers; primarily in helping them to understand what kind of place SLLSs are and may provide some ideas for those in management positions. For example, Lamitie in Chapter 5 relates his experience working in the L-café as a conversation partner and offers an awareness raising tip to increase student speaking time. In Chapter 6, Igarashi discusses setting up writing tutorials in the L-café and in Chapter 7, Fast discusses giving study abroad advice to students in the space. While still enjoyable to read, these chapters may be a bit too context-specific (Chapter 7) or too general (Chapter 6) to provide much to reflect on. The final section, devoted to the narratives of the students, illustrates how valuable and life-changing their experiences with the L-café have been. Again, while these accounts are interesting to read, it is somewhat of a ‘preaching to the choir’ exercise. However, as the narratives are written by the students and in their own words, they may be of great value in motivating and raising student awareness. In addition, the problems and affordances which came out of these narratives were likely to be extremely valuable in the formulation of Murray and Fujishima’s provisional model for SLLSs which they outline in the final chapter. In many ways, running or working in a self-access center can be an isolating endeavor. Self-access centers are often viewed by administrators, teachers and likely a large proportion of the student body, as something of an unknown quantity in the sea of formal instruction which makes up most university and post-secondary campuses. This, compounded with the fact that the people involved with running these centers, are far fewer in number than their teacher counterparts, means that it is often difficult to get fresh ideas and perspectives from outside their day-to-day dealings. Social Spaces for Language Learning shines in this regard. Reading what are essentially written reflections of the various stakeholders involved with a slightly different type of space, allows the reader to reflect on their own practices. In this way, the book functions much the same way that reading reflective diaries do in many training programs and may just spark a change or a realization that there may be other ways of doing things. The narrative style of the text lends to an enjoyable and highly comprehensible reading experience and the theoretical grounding provided by Murray and Fujishima in the final chapter ensure that the book will be of value to researchers and practitioners alike. Yes, there are some chapters which may not provide much to reflect on depending on the reader’s experience. Still, the majority of the book is thought-provoking and will likely be an excellent starting point for those interested in SLLSs. Anthony DiGiulio is a teacher and learning advisor at Kanda Institute of Foreign Languages’ self-access learning center VISTA, in Tokyo, Japan. He received his MA in TESOL from the University of Birmingham. He is a founding member of KIFL’s internal research group and his research interests include learner autonomy, motivation, and technology-assisted learning.